In the last ten years there has been a swing away from the traditional materials used for crowns and bridges like porcelain fused to metal, be it gold or non-precious metal. Empress crowns were among the first to be used and were an improvement over full porcelain jacket crowns which relied on the thickness for their strength. But Empress crowns also had a higher failure rate than I found acceptable. Materials have continued to improve and now we have what has been referred to as the “the golden child of dentistry” known as E-max crowns and its close relative known as Zirconia. Ivoclar Vivodent developed the IPS E-max system which is Lithium Disilicate in a pressable or millable form. The advantages of E-max is it’s strength and tooth like appearance. It is now the crown of choice in the front of the mouth where cosmetic appearance is paramount. It is not however strong enough to withstand the chewing forces of the back molars. For this we have 100% monolithic Zirconia. It has very acceptable aesthetics for the back teeth but it is extremely strong and can withstand the forces of mastication. In situations where we need the strength of Zirconia and the aesthetics of porcelain we have laminated Zirconia which comes into its own for use in fabrication of anterior bridges. Alongside this advancement of ceramics has been the steady improvement of CAD/CAM systems. The early ones used for dentistry were simple when compared to the huge machines used by the mechanical engineering profession. However dentistry has come into the 21st century with milling machines that give an excellent degree of accuracy combined with consistent quality. PFM crowns and bridges relied on the ability of a highly skilled ceramist, but I would have a small percentage of crowns that I was not satisfied with and had to be adjusted or remade. With the current CAD/CAM system and laboratory that I use, that small percentage of problems has all but been eliminated. The laboratory that I use is in the CBD with their milling centre in Collingwood and they are proud of their “Made in Australia” certification. The other development in dentistry is the use of digital scanners which use up to 100 photos taken in a matter of seconds to build up a computer generated digital model of the mouth. The cost of these digital scanners is close to $40,000 at present, but I suspect as they become more accurate than they are now, and competition between the manufacturers of these scanners, the price will come down somewhat. For now an additional silicon impression still works very well as I can examine it with the microscope for quality and accuracy. Crowns, veneers and bridges are generally a more complicated way to restore teeth and usually regarded by patients as being expensive. They do cost considerably more than composite or amalgam restorations, but when compared to their strength, natural appearance and durability, they represent good value over time. When we look at the indications for crowns, veneers and bridges it becomes apparent just how and why they can be the most economical way to restore teeth. Obviously, there are many factors out of our control so we can not guarantee how long a bridge or any of our work will last. However we do use evidence based principles and guidelines to give a degree of predictability of our work. The most critical part of all crown and bridge work is the fit between the restoration and the tooth. This is why I use an operating microscope for all my work. At eight times magnification it is possible to achieve a margin that is smooth, sound and without fractured enamel prisms that will stop the crown fitting down fully. Remember that the enemy to longevity of all dentistry are bacteria. They are so small that they are able to penetrate the smallest of microscopic cracks, breed there and cause recurrent decay. Also a poorly fitting crown will cause gingival inflammation and periodontal disease. There are many reasons why a crown can be the best option when considered with other alternatives. A crown is indicated in the following situations. 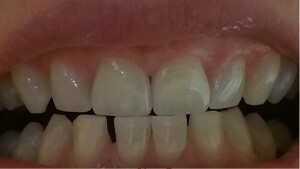 Consider a tooth that has a large restoration that has increased in size each time it is refilled because a piece broke off, or the edge of the restoration started to decay again because food and plaque were able to accumulate because it was difficult to floss, or a cusp fractured off while eating nuts or even wholemeal bread. Almost all Baby Boomers will have experienced this! Both amalgam and composite restorations rely on the strength of the tooth to survive, so as the size of the filling increases, the amount of tooth structure left decreases. There is a critical point at which the tooth’s integrity has been compromised beyond its ability to resist fracture. That point is generally accepted to be when the width of the filling is half or more of the width of the tooth. The ideal situation is to have the smallest filling possible and one third the width of the tooth is regarded as the maximum for a predictably long life of the restoration. So if a tooth has decayed such that a couple of cusps have been lost or a cusp has fractured off due to biting into an unexpectedly hard object, a composite or amalgam restoration is not going to last because the tooth structure has become compromised. In this situation we then need a restoration that is strong enough to support itself, protect and strengthen the tooth and restore the tooth to its full size and shape. There are a number of options available to us. Years ago a gold inlay or onlay that overlapped the cusps, protected the tooth from future fractures. Gold inlays and onlays are difficult to do well and if they are not perfectly fitting they are prone to recurrent decay and look unsightly. Gold always looks black in photos and I have known patients to be worried that they could be attacked for the gold in their mouths. A more recent and aesthetic solution was the Cerac Crown and the pressed porcelain onlay. Both of these have their limitations and are close to the cost of a crown anyway. In days gone by it was common to patch teeth along with large amalgams that kept breaking and had to be replaced on a regular basis. By the time it had been replaced 5 or 6 times the patient could have had a crown for the same cost. It is difficult for patients to understand why crowns vary in cost from dentist to dentist. A good comparison is this variation in the cost of cars. Generally the more expensive the car the better the quality of the materials used and the better the build quality. Crowns today can be made from many materials, from all ceramic blocks that are milled in a machine or ceramic blocks that are heated to the point that they flow under pressure into a mould. They can be made of many types of metal, both precious gold alloys and base metals. Also porcelain can be fused onto a metal coping giving the advantage of the strength of metal combined with the natural beauty of porcelain. Over fifty years ago the “gold standard” was established with the introduction of VMK crowns. This system was so good that we still use the shade guide developed at the time by the Vita Company. The system used a gold platinum alloy manufactured by the “Degussa” company and “Vita” porcelains. At the other end of the quality scale are cheap non precious metals that porcelain is fused to. The process is well known in our homes as enamel baking dishes and enamelled cast iron baths. As we know they are easily chipped. Non precious metals oxidise over time causing stresses to build up under the porcelain the pressure of the bite in normal chewing fractures off pieces of porcelain. It is possible to fracture porcelain off precious metal crowns but it is much less likely. I only use semi precious and precious gold platinum alloy with quality porcelain fused to it. The other factor is the quality of workmanship of the crown. My technicians are across the road from the surgery. They only do the best quality work and most of their clients are Prosthodontists. It is possible to get crowns made overseas for a fifth of the cost but the quality is poor. Also it is important to use only materials that have been approved by the Therapeutic Goods Administration. Obviously materials from overseas are not subject to this safeguard. Of course the technician is limited by the quality of the impressions that they get and the quality of the preparation by the dentist. By using the operating microscope at eight power magnification I am able to prepare the tooth precisely so the technician can see clearly where the margin of the crown goes to. I supply my technician with full mouth polyvinyl siloxane impressions that I inspect under the microscope. This is the most dimensional stable materials available. Also I give them a bite registration and if required take the patient across to the lab for a custom shade to be taken. As a result almost all crowns and bridges fit without any adjustment needed. My technician seals the porcelain margins of the crowns under twenty power magnification and I am able to check the margins under twenty-four power magnification. More recently we are seeing more of a phenomenon known as the Cracked Tooth Syndrome. That is where the tooth develops cracks that over time progressively get larger. Pain on biting is often the sign of a cracked tooth. Commonly these cracks are associated with large amalgam fillings but can be on otherwise perfect teeth. The only treatment we have is to crown these teeth to stop the lateral loading between the cusps. If this is not done soon enough the tooth can still split in two and then it will be lost. All posterior teeth that have been root treated (Endodontic therapy) should be protected with a crown. When I find that a posterior tooth needs endodontic treatment, I always talk to the patient about crowning the tooth as part of the overall treatment. Extreme bruxism, (grinding the teeth at night due to stress) often requires crowns to replace the lost tooth tissue and build up the correct dimensions of the bite. Usually, this treatment is complex and requires careful planning and involves many teeth, perhaps even most of the teeth in both arches. Veneers are a thin layer of porcelain bonded to the front surface of usually the front teeth to improve appearance. This can be purely cosmetic in nature to improve the appearance of otherwise satisfactory teeth. This must be done only after careful consideration to the benefits compared with the costs, both financial and biological as the teeth are cut to allow proper contour of the facing. If the treatment is for cosmetic reasons only, GST is also payable on the cost of treatment. However veneers can be a good way to strengthen heavily restored front teeth, or peg teeth that are not full size. Also veneers can be used to change the shape and position of a tooth to make it function better. In these cases GST is not payable as the treatment is to restore function. Veneers can be used to mask stained teeth or dark teeth that have been root treated, but the best result is achieved when the underlying tooth is a natural colour that is enhanced with the veneer. When a tooth or teeth have been lost we usually want to replace it as patients generally do not want to walk around with missing teeth. Years ago we would often provide a removable denture to replace missing teeth. Today our patients want something more functional and permanent. If the teeth either side of the missing teeth are heavily restored and would benefit with crowns then a bridge is often the solution. A bridge is several crowns joined together to span the gap between the teeth. This can be as simple as two crowns, one the abutment crown covering a strong tooth and the other (the pontic) replacing the missing tooth. Sometimes when several teeth are missing in the arch, a bridge could be as many as twelve teeth as one piece. Designing bridges can be quite challenging as we are getting some teeth to also do the work of other teeth as well. Simple engineering principles apply. The most stable bridge is one that is supported at both ends and in general short bridges are better than long ones. Some teeth are more suitable than others as support teeth. Teeth with a large root surface are the best to use such as molars and canines. Usually, we would want two teeth to share the load of three, as when planning a bridge we want it to last a very long time. This can be as long as thirty years and represents good value for the cost involved. Generally we would want a minimum of ten years and would regard this as a success.